New food trends emerge regularly. There’s no way to tell if they are here to stay (although, if they conquer Instagram feeds, we can rest assured we’re going to see them for a while). Similarly to what happens in the world of fashion, food trends are not always new, but they’re often classics or traditional elements, revisited or re-interpreted. I’m always curious and excited, especially about gourmet food trends. My foodie self can’t wait to try them out, while my tea-junkie self can’t wait to design the perfect pairing with tea. Tea is amazing on its own but its potential beyond the cup is still mostly uncharted territory. Pairing tea with food is an excellent way to explore its endless, yet often underrated possibilities. Let me show you my favorite trends of the moment and how I like to pair them with tea. But first, a word about pairing. When pairing tea and food, I recommend loose-leaf teas for their complexity and flavor. For a successful tea and food pairing, you want to consider flavor notes, temperature and texture of the tea and the food you’re pairing it with. You can pair by similarity (matching) or by contrast (contrasting), a simple principle borrowed from wine pairing. Generally, teas with subtle flavor and aroma notes are enhanced when paired with food with similar tasting notes (matching). More robust teas really shine when paired with food that is equally robust but has a totally different flavor profile (contrasting). Take a sip of tea, a bite of food and another sip of tea. If one flavor cancels or overpowers the others, the pairing might not be working very well. A successful pairing is like a symphony in your mouth: aromas, flavors, and textures combined harmoniously. Keep in mind that these are general guidelines; ultimately, taste is very subjective. I encourage you to experiment and play around with different teas and different sweet and savory dishes. But most importantly, have fun! Artisanal charcuterie is seeing a comeback right now. Italy (like France and Spain) is famous for the great variety of its traditional cured meats, salumi. Growing up in Italy, they were an everyday staple. Now I find myself craving some from time to time. Here in San Francisco, we are lucky enough to have a small artisanal butcher, the Fatted Calf, right here in our neighborhood. They make all of their charcuterie in house (with the exception of prosciutto) and they are super popular, almost local rockstars. Bresaola is lean cured beef from the Valtellina valley, in northern Italy. It is served thinly sliced, either on its own or seasoned with a drizzle of olive oil and a few drops of lemon juice. It’s mildly salty and has a slightly floral aroma and a distinctive jerky-like beef flavor. It works really well with the nutty and slightly fruity notes of the 2nd flush Darjeeling Steinthal. Lonza, cured pork loin with honey and sage, has more fat than bresaola, it’s sweet and bold and aromatic. It needs a tea pairing that can hold its ground. Hojicha, a heavily roasted Japanese green tea, with its deep flavor notes of fire-roasted chestnuts, caramel and lingering sweetness turns out to be a great match! The king of Italian salumi. Matcha, with its grassy and umami notes, is wonderful with salty, slightly fatty prosciutto. Serve with some ripe and sweet Mission figs and never look back! Long before moving to San Francisco, I had heard about the local sourdough bread “movement”. Yes, it is as iconic as the Golden Gate Bridge. I am a big fan, but I never would have thought I would bake my own sourdough loaf one day. It has become a weekly ritual for me and it’s the epitome of slow living, just like tea. 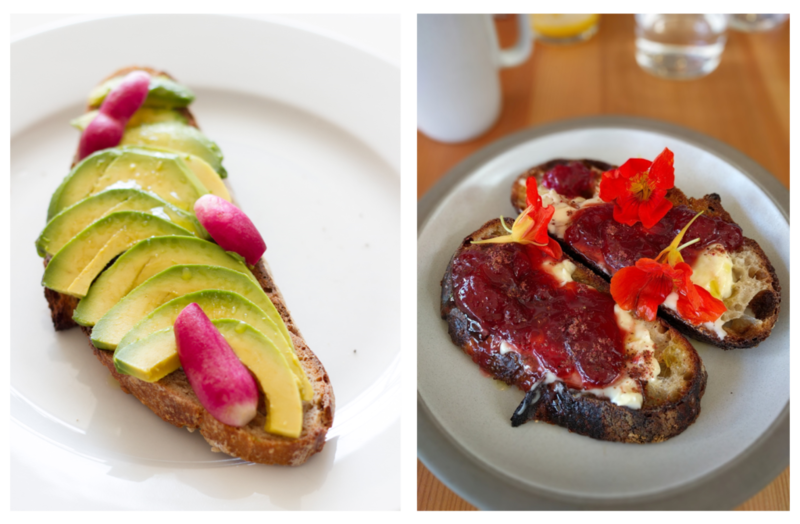 Sourdough bread toast is a huge trend and my favorite combinations are a sweet version with crescenza (an Italian soft-ripened cheese) and chunky strawberry jam topped with fresh nasturtium flowers and a drizzle of extra virgin olive oil and a savory version with avocado and fresh radishes. I had the sweet version at Tartine Bakery’s Manufactory. It pairs really well with a medium-roasted oolong like a Tie Guan Yin Chinese oolong or a Dong Ding Taiwanese oolong. There are many flavor layers; there’s the creamy and smooth cheese with notes of lemon and yeast; the sweetness of the strawberry jam, the peppery nasturtium flowers, the umami savoriness of the olive oil, the subtle sour notes of the bread, chewy on the inside, encased in a charred crispy crust. A medium-roasted oolong stands up pretty well to it, thanks to its toasty, sweet and fruity notes with floral aromas and a pleasant mineral finish. The second version, the avocado toast, shines for its simplicity but it’s a bit more controversial. It has been dubbed “the reason why millennials can’t afford to buy houses,” owing to its outrageous price. By the way, if you are concerned, you can make it at home for a fraction of it. Avo toast has been around for a long time in California and was just something you would do to deal with the excess fruit from your yard. From humble beginnings to stardom! Sprinkle some matcha on top or serve alongside a cup of genmaicha, Japanese green tea with toasted brown rice, for a perfect combo of toasty, vegetal and umami notes. Tea shows terroir too! Which is why pairing tea with oysters felt like the most natural thing to try. It’s the kind of pairing that makes your taste buds dance and your heart skip a beat. Because of the importance of temperature in this pairing, I cold brewed some green teas (I can’t imagine eating oysters and washing them down with a warm beverage). Serve your cold brewed green teas ice cold (straight out of the fridge, no ice cubes). As for the oysters, since you are eating them raw, make sure they are extra fresh! 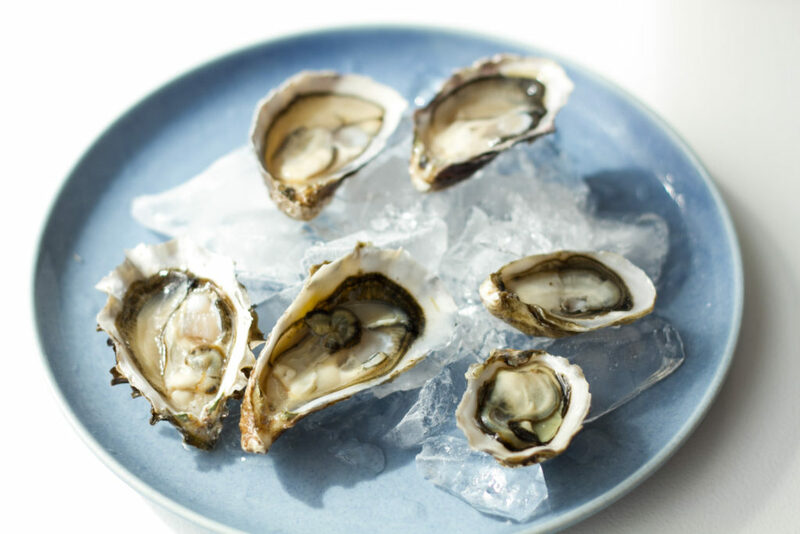 Why it works: the smoky notes of the Gunpowder tea enhance (without overpowering) the slightly smoky finish of these oysters, which are deliciously plump, sweet, moderately briny and mineral. Why it works: this savory, medium steamed tea with a hint of umami and round grassy aftertaste enhances the vegetal and cucumber notes of these sweet, milky, buttery oysters, while cutting through their richness. Negroni is an iconic Italian cocktail, now ubiquitous here in the US. Why is it so popular? For one thing, it’s Italian, need I say more? (just kidding, of course). It’s a simple recipe (just 3 ingredients in equal parts, Campari, gin and sweet vermouth) and it doesn’t require any special bar tools. Nevertheless, it’s a very sophisticated cocktail. Its strong flavor, with bitter and sweet notes, might not be for everyone but our palates have evolved to appreciate the bitter flavor (think craft coffee, kale and dark chocolate, for example). 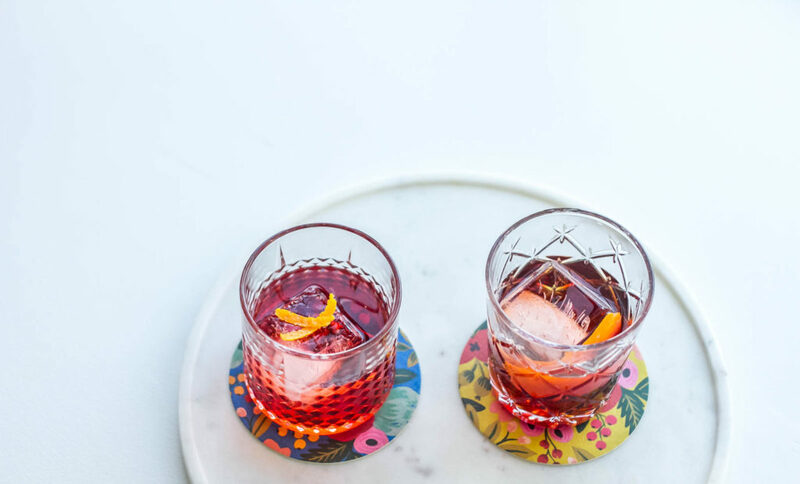 As it turns out, tea is perfect to create playful variations of Negroni. Let me introduce you to the Tea-groni, two ways! I came up with two versions, one floral and more feminine, featuring jasmine green tea infused gin and one bolder and more masculine, made with ripe pu er tea infused gin. It’s hard to pick a favorite! The hype surrounding coconut water fits within the growing demand for anything perceived to be healthy and natural. It is naturally sweet and has popped up in plant-based smoothies and green juices everywhere, but it is said to be somewhat of an acquired taste. I found it to be a tasty addition to iced tea. Here is my favorite flavor combination. Cold brew some Mao Feng green tea. 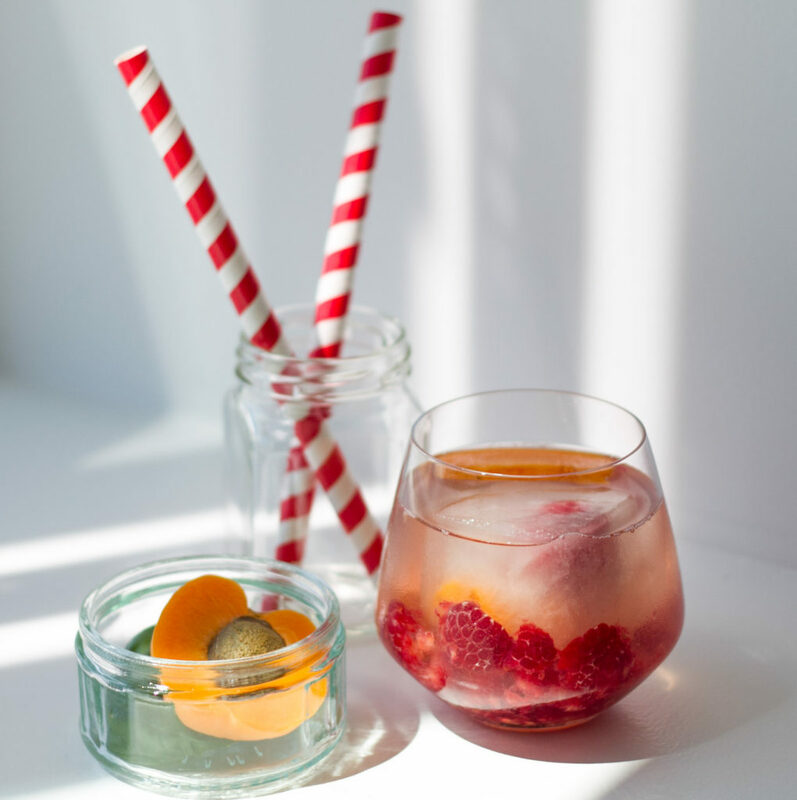 To prevent your iced tea from being watered down by ice cubes, I use coconut water instead of water to make my ice cubes and add in some fresh seasonal fruit like apricots and raspberries to make them colorful. To sweeten your iced tea, I recommend a dash of simple syrup infused with grains of paradise (Guinea pepper corns). Anna Mariani is a San Francisco-based tea blogger at The Tea Squirrel. She’s a recipe developer, tea consultant, self-taught photographer, traveler and obsessed foodie on a mission to transform tea into an approachable and fun experience. She loves tea and food pairings and she’s fascinated by the great potential tea has in bringing people together and bridging cultures. Follow The Tea Squirrel on Facebook (@teasquirrel) and Instagram (anna.mariani86).